The film was directed by Henry Koster and produced by Frank Ross. The screenplay was adapted by Gina Kaus, Albert Maltz, and Philip Dunne from Lloyd C. Douglas' eponymous 1942 novel. The score was composed by Alfred Newman, and the cinematography was by Leon Shamroy. The film stars Richard Burton, Jean Simmons, Victor Mature, and Michael Rennie and co-stars Dean Jagger, Jay Robinson, Richard Boone, and Jeff Morrow. The Robe had a 1954 sequel Demetrius and the Gladiators. In Ancient Rome, Judaea, Capri, and Galilee (in the time period stretching from 32 to 38 AD. ), Diana (Jean Simmons) tells Emperor Caligula that she has not heard from Marcellus Gallio (Richard Burton) for almost a year, when Marcellus was in Cana of Galilee. At that time, Marcellus was told by Paulus that Caligula had become the emperor. Marcellus Gallio, son of an important Roman senator (Torin Thatcher), and himself a military tribune, introduces through flashback narration, the might and scope of the Roman empire. Marcellus is notoriously known as a ladies’ man, but is captivated by the reappearance of his childhood sweetheart, Diana, ward of the Emperor Tiberius. Diana is unofficially pledged in marriage to Tiberius's regent, Caligula. In a slave market Marcellus bids against Caligula for a defiant Greek slave, Demetrius (Victor Mature), and wins. Angrily, Caligula issues orders for Marcellus to receive a military transfer to Jerusalem in Palestine. Marcellus has Demetrius released and orders him to go on his own to the Gallio home. Marcellus is surprised to find Demetrius waiting for him when he arrives. Unofficially, Marcellus had freed Demetrius, but Demetrius feels honor bound to compensate Marcellus by being his servant. Demetrius accompanies Marcellus to Palestine but, before the galley sails, Diana comes to see Marcellus, pledging her love for him and her intention to intercede on his behalf with Tiberius. Marcellus declares his love for Diana and asks her to make the emperor promise not to give her in marriage to Caligula. Marcellus rides into Jerusalem with the centurion Paulus (Jeff Morrow) on the same day as Jesus's triumphal entry on Palm Sunday. Demetrius locks eyes with Jesus and feels compelled to follow him. Jesus is arrested and condemned by Pontius Pilate (Richard Boone), the procurator. Marcellus reports to Pilate, who informs him that the emperor has sent for him. Before Marcellus departs, he is ordered to take charge of the detail of Roman soldiers assigned to crucify Jesus. Marcellus wins the robe worn by Jesus in a dice game and is told it will be a reminder of Marcellus's first crucifixion. Returning from the crucifixion with Demetrius, Marcellus uses the robe in an attempt to shield himself from a rain squall, but feels a sudden crushing guilt for crucifying Jesus and tears the robe off. In a fit of rage, Demetrius curses Marcellus and the Roman Empire and runs away, taking the robe with him. Marcellus now behaves like a madman haunted by nightmares of the crucifixion. He reports to Emperor Tiberius at Capri, who gives him an imperial commission to find and destroy the robe, while gathering a list of names of Jesus' followers. At Diana's request, Tiberius leaves her free to marry Marcellus, though Tiberius believes Marcellus is mad. Marcellus travels to Palestine, seeking to ingratiate himself with Justus (Dean Jagger), a weaver in Cana, and the Christian community that he leads. He sees examples of Christian life in Justus's miraculously healed grandson and in the paralytic Miriam. Marcellus finds Demetrius alone in an inn and demands that he destroy the robe, believing it has cursed him into madness. Demetrius tells him the robe has no real power, that it only reminds Marcellus of what he did, and it is his guilt over the killing of an innocent man that has caused him to become so troubled. Demetrius gives the robe to Marcellus, who refuses to touch it. He is terrified, but as the robe touches him, he is relieved from the burden and becomes a Christian. Justus calls the villagers together and begins to introduce Peter, when he is killed by an arrow from a detachment of Roman soldiers. Marcellus intervenes and Paulus informs him that his orders are no longer valid; Tiberius is dead, and Caligula is emperor. Marcellus informs Paulus that an imperial commission is valid until specifically countermanded by the new emperor. Paulus tells Marcellus to make him obey via a sword duel. After a prolonged struggle, Marcellus prevails. Rather than killing Paulus, Marcellus hurls his sword into a tree. Paulus, humiliated by his defeat, orders the soldiers to leave. Peter invites Marcellus to join Demetrius and him as missionaries. Marcellus hesitates, out of guilt; but when Peter tells him of his own denial of Jesus, Marcellus confesses his role in Jesus' death. Peter points out to him that Jesus forgave him from the cross, and Marcellus pledges his life to Jesus and agrees to go with them. Their missionary journey takes them to Rome, where they must proceed "under cover" as Caligula has proscribed them. From Rome, Caligula summons Diana from her retreat at the Gallio home, to tell her that Marcellus has become a traitor to Rome by becoming a Christian. He takes her to the guard room where a captured Demetrius is being tortured. Diana runs out of the palace to Marcipor (David Leonard), the Gallio family slave, who is secretly Christian. Diana guesses that he is a Christian and has seen Marcellus, and so she gets Marcipor to take her to see him. Marcellus and Diana are reunited, and Marcellus tells her the story of the robe and his Christian conversion. Diana helps Marcellus rescue Demetrius. Peter comes to Gallio, where Demetrius has been taken, and heals him. Caligula issues orders to bring Marcellus to him alive to stand trial by the end of the day. After witnessing Peter's healing of Demetrius, the physician attending Demetrius goes to denounce them to the authorities. Marcellus' father disowns him as an enemy of Rome. Marcellus flees with Demetrius, but when Marcellus gives himself up so that Demetrius can escape, he is captured and put on trial. Caligula makes Diana sit next to him for Marcellus's trial. Marcellus admits to being a Christian; however, he denies the charge that Christians are plotting against the state. Marcellus tries to show Caligula his opportunity to accept Christ as he tries to hand the robe to Caligula, but Caligula refuses to touch it, as he considers it to be "bewitched". Caligula condemns Marcellus to death by the wish of the members of the audience, based on what they have heard. Diana then accepts Christ and seeks to join Marcellus, the man she considers to be her husband, in His Kingdom (Heaven). She also denounces Caligula as an insane, tyrannical monster. Caligula condemns Diana to die alongside Marcellus. As they depart the audience hall for their execution, Marcellus is acknowledged by his repentant father, and Diana gives the robe to Marcipor. Despite the careful attention to Roman history and culture displayed in the film, some inaccuracies are included: in reality, the Emperor Tiberius' wife Julia, who had been banished from Rome by her father Augustus years before Tiberius acceded to the imperial throne, was already dead. The Robe was originally announced for filming by RKO in the 1940s and was set to be directed by Mervyn LeRoy, but the rights were eventually sold to Twentieth Century Fox for $100,000. Jeff Chandler was originally announced for the role of Demetrius. Victor Mature signed in December 1952 to make both The Robe and a sequel about Demetrius. John Buckmaster tested for the role of Caligula. Filming finished on 30 April 1953, two weeks ahead of schedule. The film was advertised as "the modern miracle you see without glasses", a dig at the 3D movies of the day. 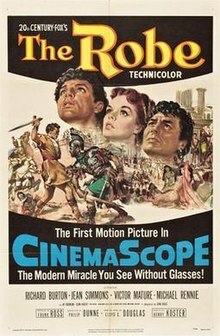 Since many theaters of the day were not equipped to show a CinemaScope film, two versions of The Robe were made: one in the standard screen ratio of the day, the other in the widescreen process. Setups and some dialogue differ between the versions. The film was usually shown on television using the standard 1.33:1 aspect ratio version that fills a standard television screen rather than the CinemaScope version. American Movie Classics may have been the first to offer telecasts of the widescreen version. Recent DVDs and Blu-ray Discs of the film, however, present the film in the original widescreen format, as well as the multitrack stereophonic soundtrack. When the original soundtrack album was issued on LP by Decca Records, it used a remix for only monaural sound rather than the stereo sound that was originally recorded. MCA, which acquired the rights to the American Decca recordings, issued an electronic stereo version of the mono tape. Charles Gerhardt conducted London's National Philharmonic Chorus. In 2003, Varèse Sarabande released a two-CD set of the original stereophonic recording on their club label. The elaborate poster for the film has one glaring flaw. The woman's face is not Jean Simmons. Originally, Jean Peters had been cast as Diana, but became pregnant. Simmons was hired to replace her. But the poster was not changed, and shows the wrong Jean. The film earned an estimated $17.5 million in North America during its initial theatrical release. Its worldwide rentals were estimated at $32 million. Bosley Crowther of The New York Times wrote, "The human drama of this story of Christian conversion occurs amid sumptuous and scenic surroundings and are mighty impressive to see. But the mightiness of surroundings—the spectacle of settings and costumes—is meaningful only in relation to the story that is being told. And the story in this instance is not spectacular, so that the amplitude of its surroundings does not enhance its scope." Variety wrote, "It is a 'big' picture in every sense of the word. One magnificent scene after another, under the anamorphic technique, unveils the splendor that was Rome and the turbulence that was Jerusalem at the time of Christ on Calvary." Edwin Schallert of the Los Angeles Times stated that the film was in "a class that is unique, deeply spiritual and even awe-inspiring." Richard L. Coe of The Washington Post wrote, "Partly through the writing, partly through the variety of acting styles, this reverence does not stir the emotions. It is very hard to take seriously a film which presents so petulantly obvious a performance as Jay Robinson's sophomoric Caligula or a script which early observes: 'You have made me the laughing stock of Rome.' These and matters like them are not aspects of fine motion picture making." Harrison's Reports declared, "Excellent! Even if it had been produced in the conventional 2-D form, Lloyd C. Douglas' powerful novel of the birth of Christianity in the days of ancient Rome would have made a great picture, but having been produced in the revolutionary CinemaScope process, it emerges as not only a superior dramatic achievement but also as a spectacle that will electrify audiences with its overpowering scope and magnitude." The Monthly Film Bulletin called it "a routine addition to the numerous Hollywood Biblical films," presenting "a characteristically distorted and simplified view of Imperial Rome, with a ranting Caligula, a doddering Tiberius, and the customary scenes of 'spectacle' in the palace, the market-place and the torture chamber. The performances lack enthusiasm, and Richard Burton in particular seems ill at ease as the morose Marcellus." Basil Wright wrote in Sight & Sound, "As a film on a religious subject, Henry Koster's The Robe has rather fewer lapses in taste than most of its predecessors. If the actual speaking of Christ's cry from the Cross is a major error, it is not multiplied. In general, the subject is treated with reasonable reverence and is a deal better than Quo Vadis, which was a perfect illustration of Aristotle's remark about the ludicrous being merely a sub-division of the ugly." The film currently holds a score of 33% on Rotten Tomatoes based on 18 reviews. The film had one sequel, Demetrius and the Gladiators (1954), which featured Victor Mature in the title role. The Academy Film Archive preserved The Robe in 2008. The film was first telecast by America's ABC-TV on Easter weekend in 1967, at the relatively early hour of 7:00 P.M., E.S.T, to allow for family viewing. In a highly unusual move, the film was shown with only one commercial break – a luxury not even granted to the then-annual telecasts of The Wizard of Oz. ^ The Robe. Box Office Mojo. Retrieved January 20, 2010. ^ Chrissochoidis, Ilias (ed.). CinemaScope: Selected Documents from the Spyros P. Skouras Archive. Stanford, 2013. ^ "Religion: Celluloid Revival". TIME. April 24, 1944. Retrieved May 25, 2010. ^ "STAGE AND SCREEN". The Advertiser (Adelaide, SA : 1931 - 1954). Adelaide, SA: National Library of Australia. 1 August 1953. p. 7. Retrieved 12 July 2012. ^ Schallert, Edwin (1 August 1952). "Jeff Chandler Likely for Demetrius; 'Highest Mountain' New Purchase". Los Angeles Times (1923-Current File). Los Angeles, CA. p. B7. ^ Mature About to Sign as Demetrius in 'Robe" Hopper, Hedda. Los Angeles Times (1923-Current File) [Los Angeles, Calif] 19 Dec 1952: B8. ^ Victor Mature to Do 'Story of Demetrius' Hopper, Hedda. Los Angeles Times (1923-Current File) [Los Angeles, Calif] 10 Jan 1953: 14. ^ Art of Dali Will Spur Three-D; Buckmaster Flying In for Caligula Schallert, Edwin. Los Angeles Times (1923-Current File) [Los Angeles, Calif] 05 Feb 1953: A9. ^ FOX COMPLETES 'ROBE': $4,600,000 Film in CinemaScope Was 10 Years in Making Special to THE NEW YORK TIMES.. New York Times (1923-Current file) [New York, N.Y] 01 May 1953: 16. ^ "All Time Domestic Champs". Variety. 6 January 1960. p. 34. ^ "20th's Global C'Scope Jackpot". Daily Variety. 9 November 1955. p. 1. ^ "20th Counts C'Scope Blessing". Variety. November 9, 1955. p. 5. Retrieved April 24, 2019. ^ Crowther, Bosley (September 27, 1953). "Now Cinemascope! A Look at 'The Robe' and the New System in Which It Is Put On". The New York Times. Section 2, p. 1. ^ "Film Reviews: The Robe". Variety. September 23, 1953. 6. ^ Schallert, Edwin (September 25, 1953). "'The Robe' Hailed as Epochal Film". Los Angeles Times. Part 2, p. 1. ^ Coe, Richard L. (October 2, 1953). "'The Robe' Reveals Cinema Scope". The Washington Post. 55. ^ "'The Robe' with Richard Burton, Victor mature and Jean Simmons". Harrison's Reports. September 19, 1953. 152. ^ "The Robe". The Monthly Film Bulletin. 21 (240): 5. January 1954. ^ "The Robe". Rotten Tomatoes. Retrieved April 20, 2019. ^ "Oscars.org -- The Robe" Archived 2014-01-10 at Archive.today. Academy of Motion Picture Arts and Sciences. Retrieved January 10, 2014. ^ "Television: Mar. 24, 1967". Time. March 24, 1967. Retrieved May 25, 2010. Wikimedia Commons has media related to The Robe (film).